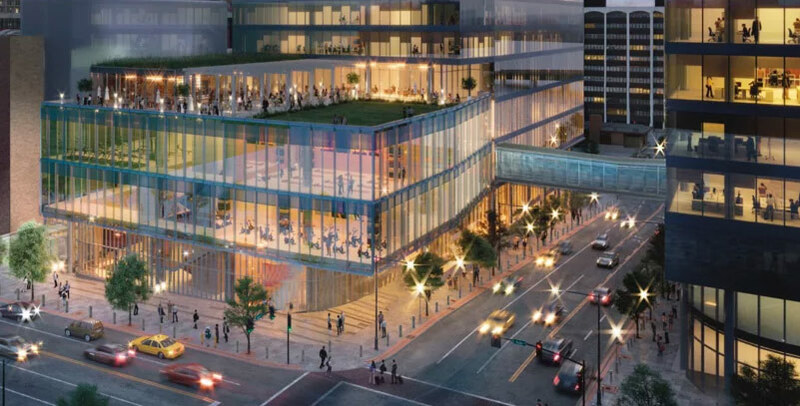 The skybridge in Clayton will connect the office tower on Hanley (subdistrict 1) to the Centene Plaza cafe and conference spaces at the 2nd floor of each building. 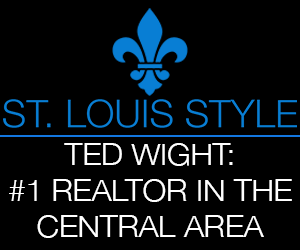 Changes from the original design include the “K” shaped form and more muted glass coloring. 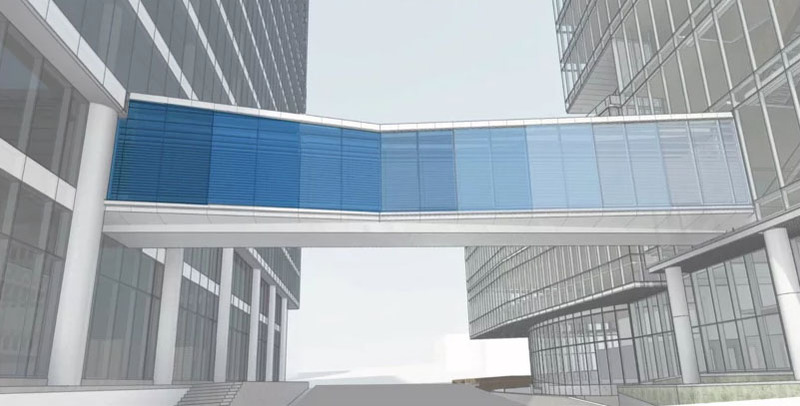 “The pedestrian bridge linking the new Centene Subdistrict 1 office tower and with the existing Centene Plaza office tower is a creative response to an important functional and safety-enhancing element. To enhance the connectivity of the Centene campus and provide an option for safe crossing over Hanley Road for building occupants, the bridge provides a weatherproof enclosure connecting level 2 of each building. An adjacent internal monumental stair in the SD1 tower allows the cross-campus link to the Centene Plaza café and conference spaces with SD1 tower café and conference spaces. This connection will benefit building occupants moving between buildings, and enhance safety, by reducing pedestrian traffic at the Hanley/Forsyth intersection known for its high level of vehicle traffic and potentially risky sloping grades. Pedestrians using this bridge will ultimately exit each tower to the Forsyth or Carondelet sidewalks as they move further east and west, activating the urban realm. The bridge architecture is complementary to both adjacent office towers, using the same base glass substrate and silver metallic painted aluminum detailing. 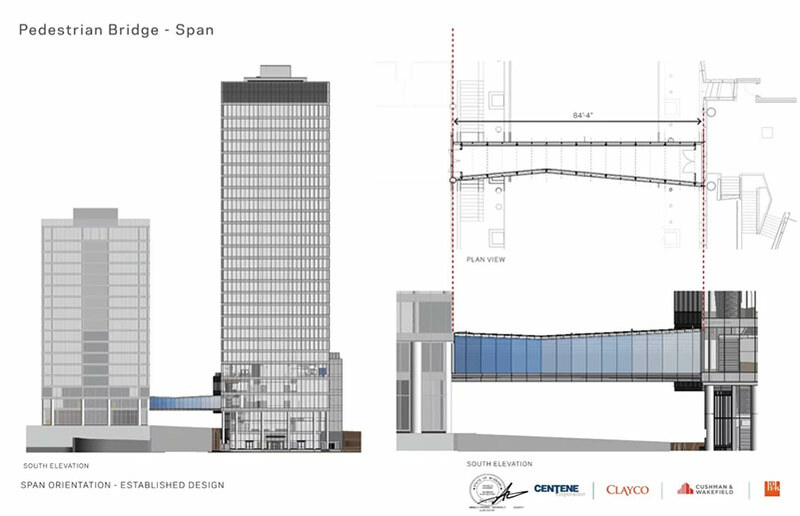 The K-shaped plan of the bridge recognizes its transition between the taller new SD1 office tower and the smaller existing Centene Plaza tower by increasing its width and volume on the larger SD1 side while decreasing it slightly at the smaller Centene Plaza side. The “pinch” near the center is offset to respect the smaller and larger office tower volumes and provide a spatially dynamic path of travel for bridge users, opening wider toward each office tower as they arrive at their destination.